We got Lettie Thanksgiving week, 2002 if my math is right. She was our little Black Friday Purchase. We were living in a three floor "farmhouse" in Chestnut Hill section of Philadelphia that I truly enjoyed for those years. With three floors there were plenty of rooms for a dog to find a comfortable spot, plenty of furniture for her to rest on. We stopped that with one notable exception that I had no control over. You see we had to. Since it was November, the weather was cool. When the weather got warmer, Our Lettie got fleas that first spring. That stopped her from sleeping on the bed, and any other furniture. But she was smart. She knew that when we were out, she had free run of the house. Sure, we'd close certain rooms off like the bedrooms, but there was one room that was just too small to bother with. It was also the one room without a door. The third floor rear as we called it. It was a small room with a sloping roof so that I couldn't even walk on the back half of it without ducking down or walking bent over. It was a pleasant place to watch the back yard grass grow, and since it wasn't large enough to do much more with, it also collected things. We would get things brought in the Jeep Wranglers we both drove at that time, as much as we could fit in them so that shopping was called "Filling A Jeep". When I took long trips, I would remove the back seat in the Jeep and put it out of sight and out of mind. Eventually that ended up in the third floor rear room next to one of those small half windows in the back of the house. Lettie discovered that and made the Jeep Seat her own. It was coincidentally placed so that half of the day it was in the sun. Yes, the dog had discovered a perch above the trees where she could watch the squirrels in the back yard, sun her bones, and do it all on a dog sized couch that really belonged in the Jeep. I didn't realize what was going on until one day I got in the house and she didn't notice it. Loading up all the groceries into the kitchen I went looking for her. Softly I climbed the stairs to the third floor without squeaking that one tread half the way up the flight. Looking right to the front of the house, nothing was there, but she was watching me from the rear on the seat. Caught. When I looked at her, her ears went down and she wagged her tail walking over to me. What else could I do. She found her place and I had created it for her by shopping for the house. The seat was rarely used as a seat, so it stayed out of the car most of the time. Perfectly sized, and luckily treated with fabric treatment, it was fairly clean. In fact, that seat is in my car to this day, the third Jeep I've had. I stopped wear and tear by putting a blanket on top of the seat as a slip cover, and more mats strategically placed through the house. Those mats lasted her life, and when she left us in April this year, Rack began to use the same mats, still strategically placed through the house here in Florida. I have the same blankets to this day. 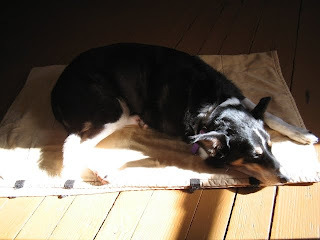 Every so often I look up and see her sitting on the blanket on the beige seat in the sun, one of the benefits of having dogs that looks so much alike that they're never completely "gone". They're just resting in a quiet and sunny corner of the mind.